Today we will be posting a regional dish in the Philippines called Dinoydoy. Dinoydoy is popular in the region of Ilocos in the Northern part of the Philippines, a place where vegetables are also abundant. Dinoydoy basically is made out of sautéed bitter melon and nearly pureed squash, it can be flavoured with bagoong or fish sauce and sometimes cooked with some fried pork pieces. The taste is quite different, its sweet and savoury but there is an overpowering bitter flavour which is one of the dishes mail quality, for the untrained palate it might be revolting but for a lot of adult Filipinos this is a flavour to crave for. Have you ever tried bitter melon, do you like them? If not will you dare to try them? In a wok sauté garlic and onions. Add pork and brown on all sides and crispy. Add chicken stock and squash and cook for 15-20 minutes or until it starts to disintegrate. 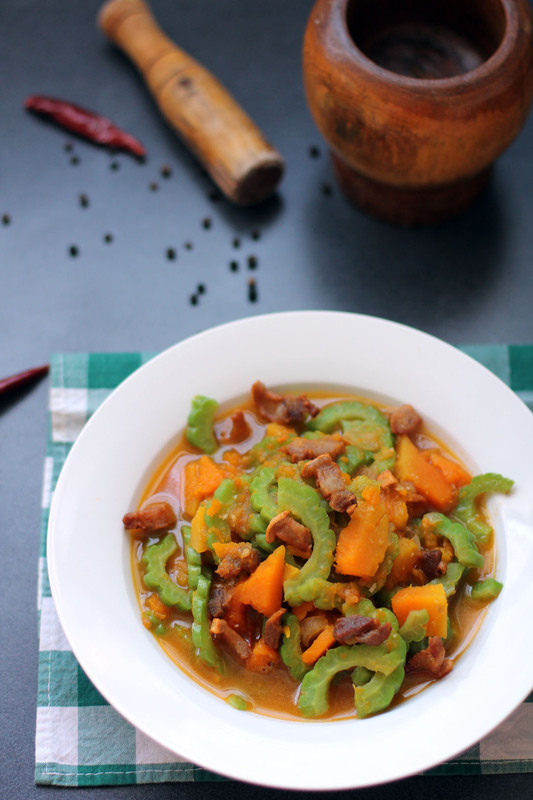 Add bitter melon then cook for 5 more minutes or until bitter melon is cooked. If you want to reduce the bitterness of the bitter melon, soak the sliced bitter melon in water with salt at least for 6 hours, replace in the water halfway. If you're ready to use drain completely and press to extract excess water. oh I haven’t tried that dish..but then it’s ampalaya..I think I’d still try it though. It’s been a long time since I’ve had bitter melon. I love how palates differ throughout the world. It’s just fascinating to me. This one is probably too bitter for me, but I’m always open to trying new things. What a great, flavorful stew, Raymund! Hi Raymund, This is such an interesting combination. Bitter melon is such an acquired taste and the delicateness of squash would surely balance it well. Another lovely dish for these cooler months!